Discover a whole new way to watch movies — the way filmmakers intended. Epson’s 4K Enhancement Technology delivers astonishing picture quality. Now every subtle intricacy is captured — even your most-loved films will offer something new. Plus, Epson’s Detail Enhancement Technology refines surface details for true-to-life images that pop off the screen. Users can adjust levels of sharpness and detail enhancement for optimal viewing. This isn’t just a new way to watch movies — it’s the best way. TK Epson’s revolutionary 4K Enhancement Technology shifts each pixel diagonally by 0.5 pixels for twice the vertical and horizontal resolution. Enjoy unbelievable sharpness and clarity, even closer to the screen. 4K Enhancement delivers immersive images. 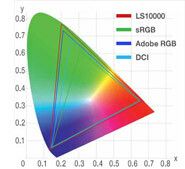 The dual laser diode illumination system — one for red and green, the other for blue — ensures balanced, high-quality images. Considering the advantages offered by a laser system, Epson’s decision to use a laser light source for the LS10000 was an obvious choice. The laser light engine’s long, 30,000-hour lifespan provides virtually worry-free operation. And, there’s no waiting for the projector to warm up or cool down — the projector reaches maximum brightness and turns off almost immediately. 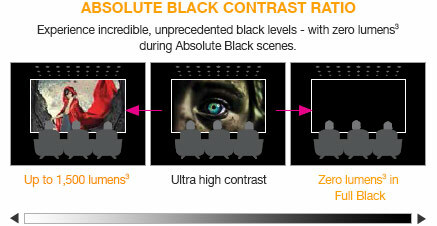 Plus, high-speed contrast control ensures both bright and dark scenes look their best. 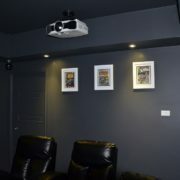 For decades, 3LCD projectors have been praised within the industry for delivering superior color and gradation. Now, with Epson’s innovative 3LCD Reflective system, you get remarkably high contrast as well. Featuring advanced liquid crystal on quartz technology, these 3LCD Reflective projectors boast exceptional performance, including an improved pixel density and increased aperture ratio for smoother, film-like pictures. Fast, quiet and precise, the EH-LS10000 allows you to preset up to 10 positions for zoom, focus and lens shift for both standard projection and wide cinema ratios. Project 2.40, 1.85 and 1.78 aspect ratios on the same screen without an anamorphic lens — and no downtime when switching between ratios. Watch movies on a grander scale at the touch of a button, without any disruptive black bars. One brightness measurement (lumens) is not enough. A projector’s specification needs to show both high white colour brightness and white brightness. If colour brightness is lower than white brightness, images may be dark, dull and lose detail. If not be sure to ask for a projector’s colour brightness specification. 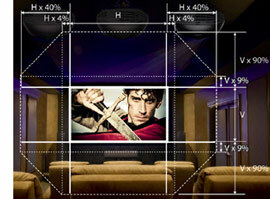 * Compared to leading 1-chip DLP Home Entertainment Projectors. Based on NPD data, July 2011 through June 2012. Color brightness (color light output) measured in accordance with IDMS 15.4. Color brightness will vary depending on usage conditions. 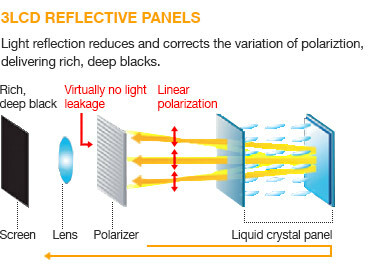 With Epson’s innovative 3LCD Reflective system, you get remarkably high contrast as well. Featuring advanced liquid crystal on quartz technology, this 3LCD Reflective projector boasts exceptional performance, including an improved pixel density and increased aperture ratio for smoother, film-like pictures. 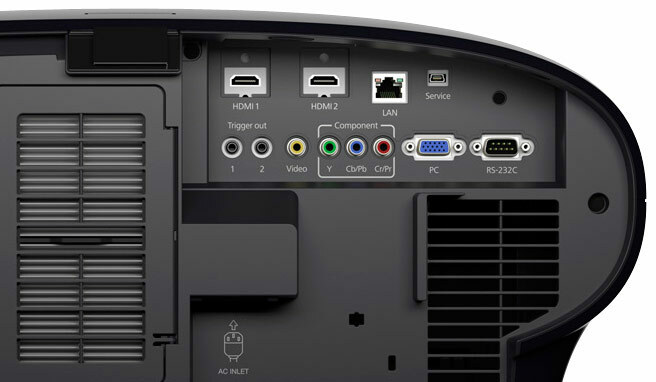 Innovations, including Epson’s unique Super-resolution with Detail Enhancement Technology, exceptional frame interpolation capabilities, as well as powerful Bright 3D Drive projection let you experience a new standard in home entertainment. In addition to added reliability and amazing colour performance, Epson’s advanced projection technology enables a wide range of lens shift capabilities for outstanding installation flexibility. The EH-LS10000 has an incredible range of up to ±90 percent on the vertical axis and up to ±40 percent on the horizontal axis. 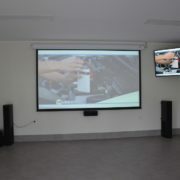 Users can operate the lens shift functions using the remote control, the projector control panel, or control commands. When it comes to home cinema, you want to focus on what’s in front of you — and nothing else. That’s the idea behind the innovative, efficient cooling system of the EH-LS10000. 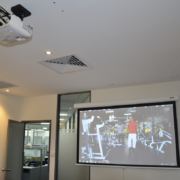 With noise levels as low as 19 dB, this is among the quietest projectors in the industry. It’s time to enjoy engaging cinema without distraction — all the better for those moments when the picture takes your breath away. Enjoy thrilling 3D adventures right in the comfort of your living room. Featuring Bright 3D Drive technology, the EH-LS10000 puts you right in the middle of the action. Epson’s drive system minimises the blackout time of 3D glasses and provides greater brightness when viewing 3D content. Transform any 2D movie, from the latest science-fiction adventure to your favourite classic, to spectacular 3D. Or, watch the big game in exciting 3D. The EH-LS10000 makes it easier than ever with convenient 2D-to-3D conversion. With just the touch of a button, you can watch your favourite shows and movies in eye-popping 3D. There are no special discs required. And, the possibilities are endless.